Just thought I'd let you know that I'm following along. Have to admit this is a mighty peculiar engine. SUPER TEE will now be a fan cooled motor! A pair of 2 in. dia. 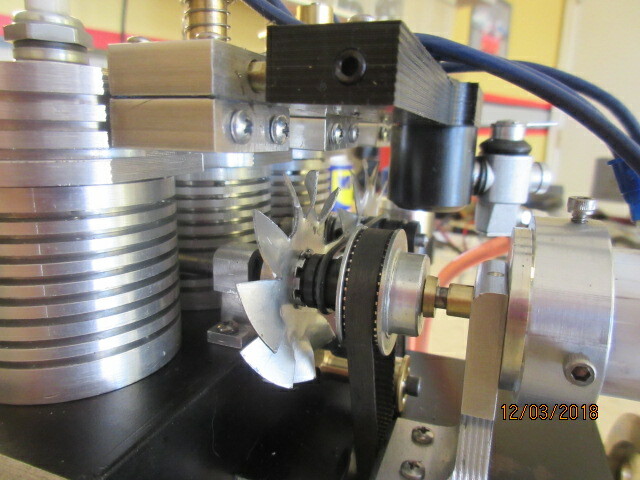 fan blades from Ace breezes air between the cylinders at twice crank speed. 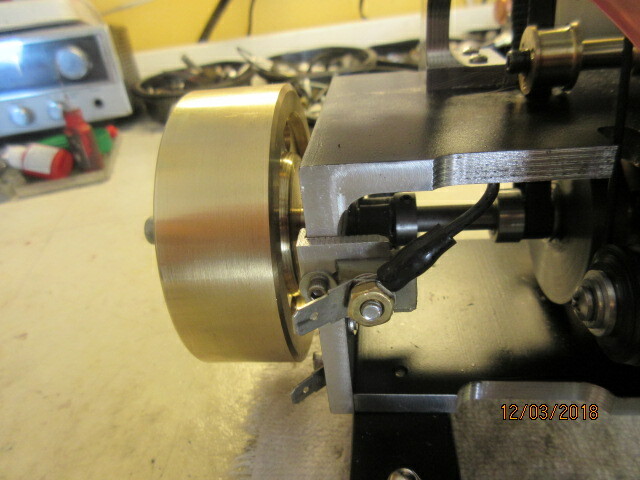 Hubs are made from Delrin and are epoxyed to the fan hub recessed area. 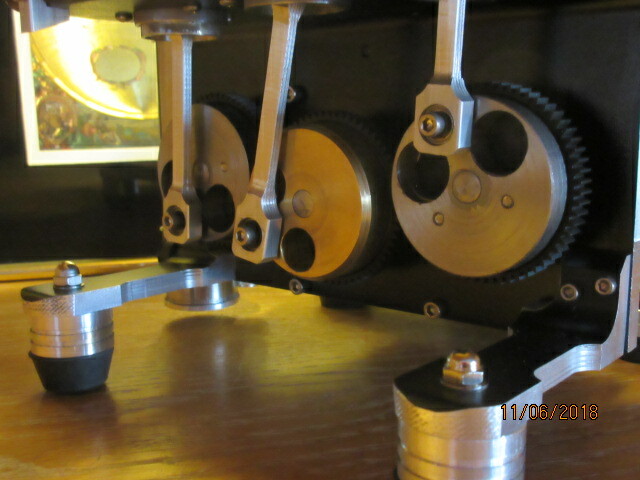 The right side fan is pressed fit onto a shaft riding in a bearing post. 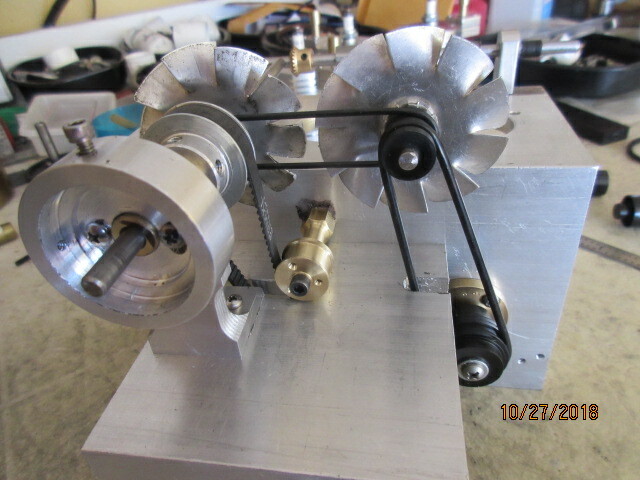 The left fan hub is over bored with a # 11 or #12 drill bit to the 3/16 in. 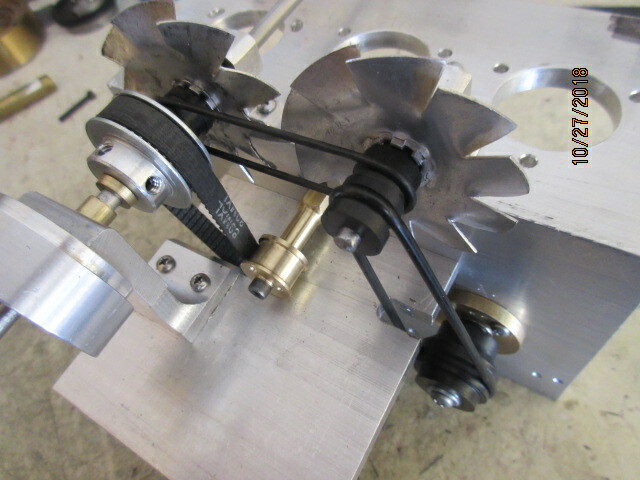 distributor shaft to free spin upon in counter rotation to the distributor drive. The fans turn counter clockwise. 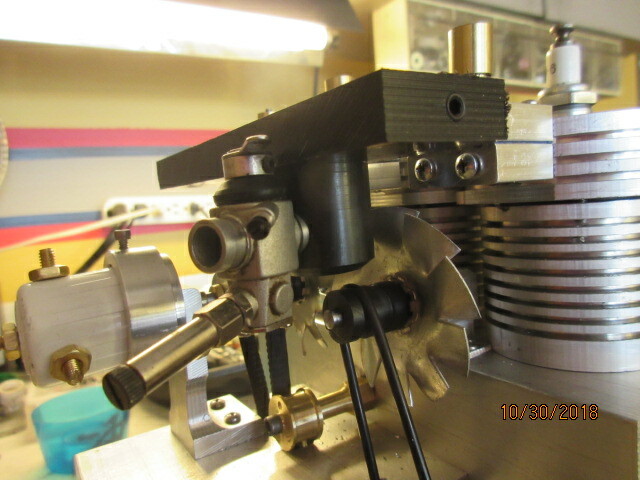 O-rings bring the power up driven by the stub shaft for #3 cylinder. A bar of Delrin for the intake manifold. Ported for some brass 3/16 in. 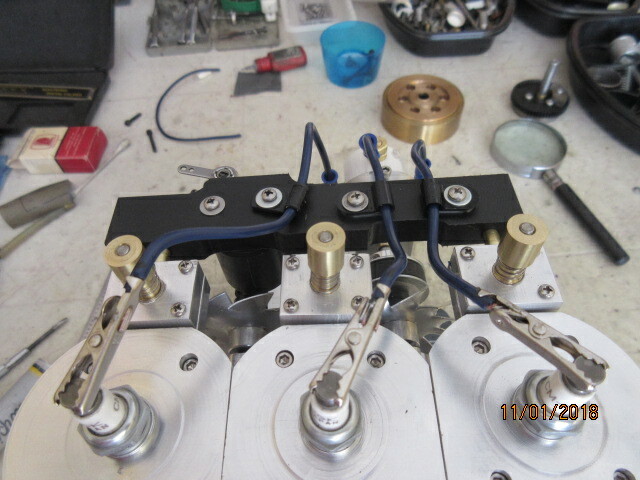 tubing to the valve blocks. 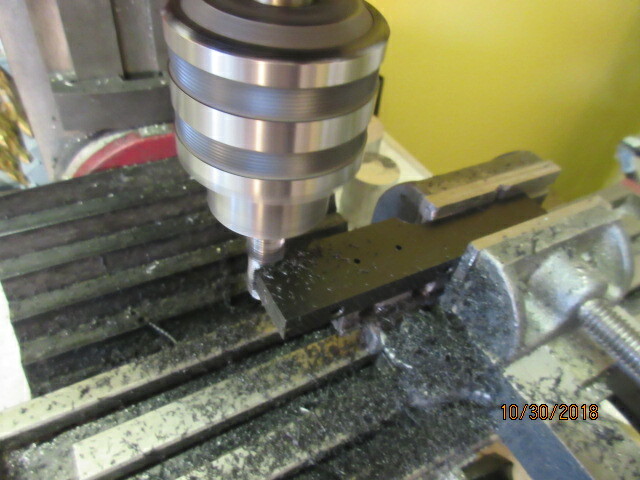 Trimming excess material away after port holes drilled. 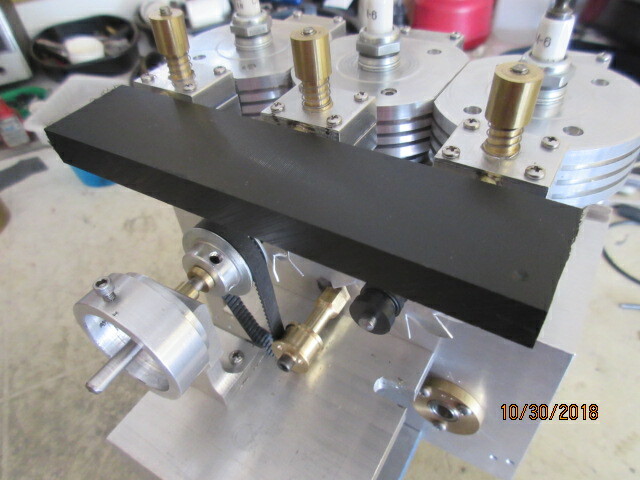 The Traxxas carburetor is mounted horizontal from the bottom on a barrel plenum chamber. 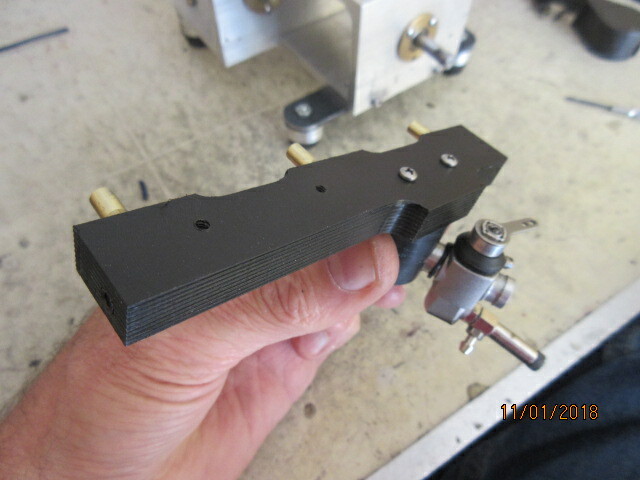 #4-40 screws draw it up to the manifold body. Fitment to engine before trim. 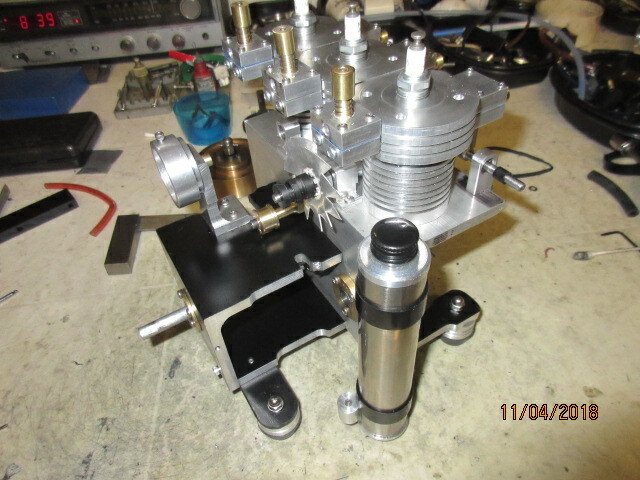 A straight shot in from the distributor for the wiring to the spark plugs. I didn't find the proper stainless plug clips on Ebay this time. These mini 'gator clips do the job and look fine. Finalizing SUPER TEE! 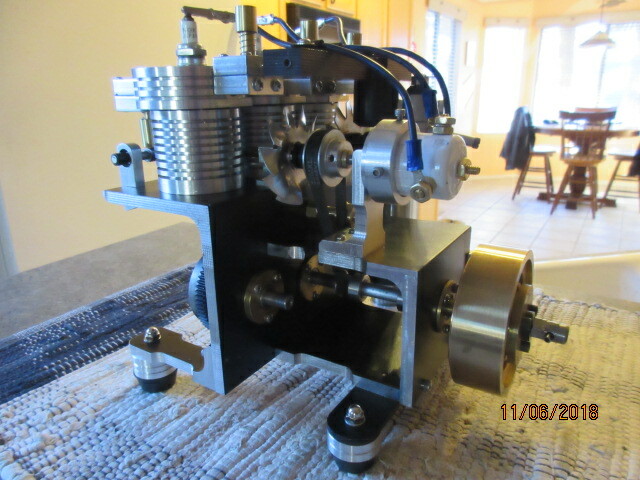 A free standing engine, vertical fuel tank strapped to the side. Just no room on the deck for it! Some paint work now and re-assembly. 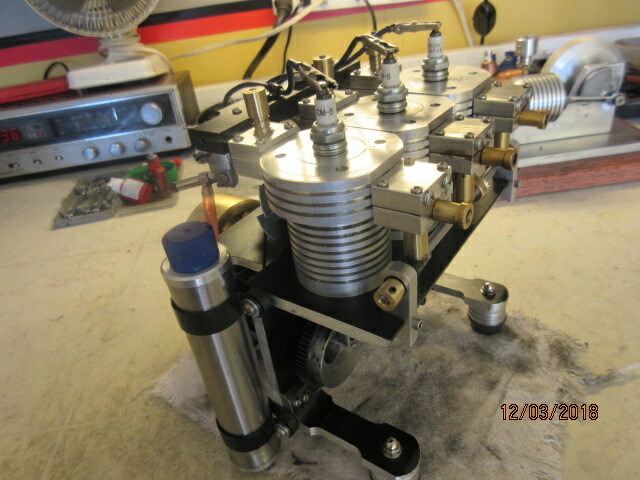 Tighten up the loose items, loosen up the tight items and then readied for run trials. 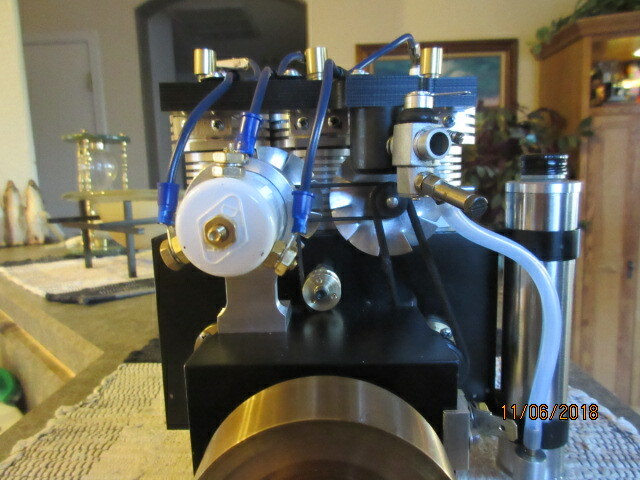 You will get your first look/see at the business side of this engine......this weekend! 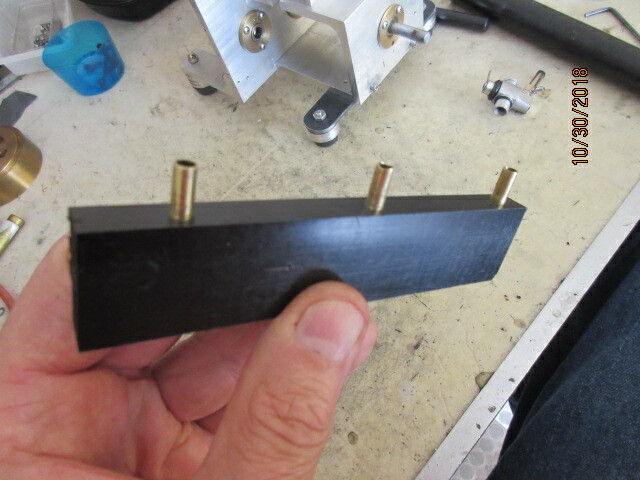 Although it looks a little disconcerting, the crank pin phasing is correct for SUPER TEE. And now...."A Little Engineering Explanation" by Longboy! 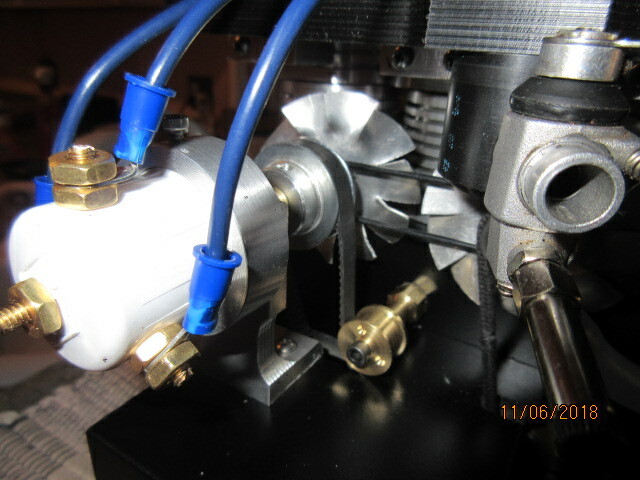 Crank pins for 3 cylinder engines are at 120 degrees. Looks like the figure on left at 12, 4 and 8 o'clock position looking end wise down crankshaft. 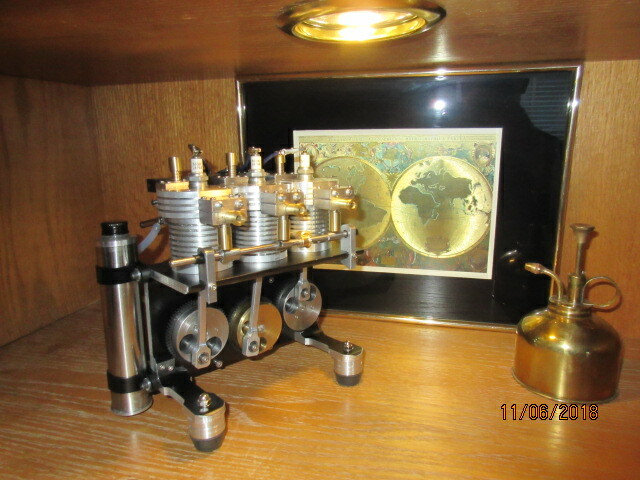 For a geared crankshaft, it is 12, 8 and 8 looking across, right to left next figure. 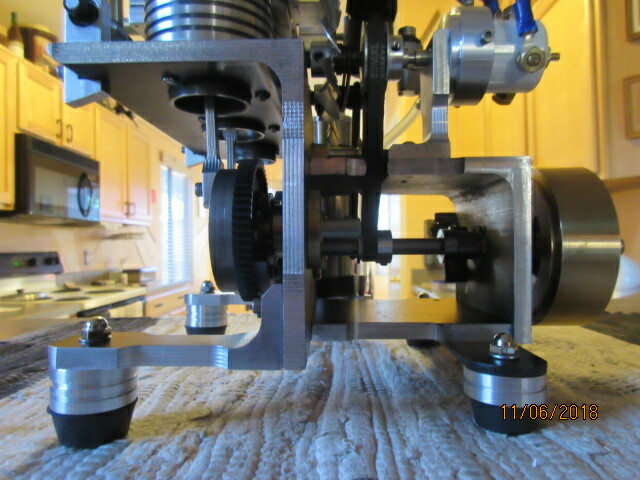 Firing order 1-2-3. 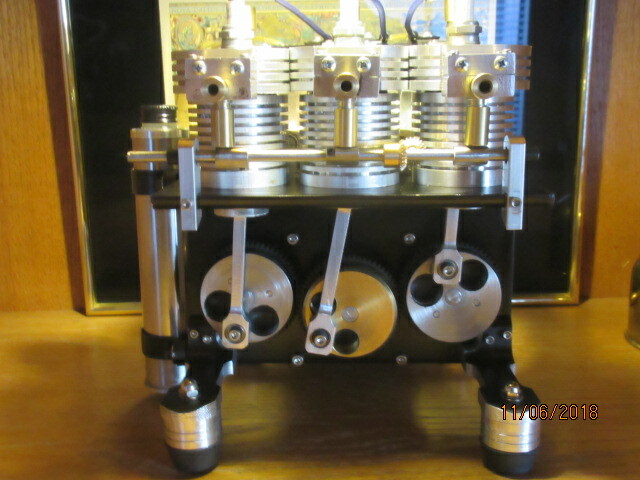 Yep.....I did ......do a 12,4,8 set-up initially and it looked outta wack, the pistons coming up to TDC then. Apparently, I did get it right figuring in the counter rotation. Come back tomorrow to see SUPER TEE at work! Looking forward to seeing this in action! 3 cylinders. 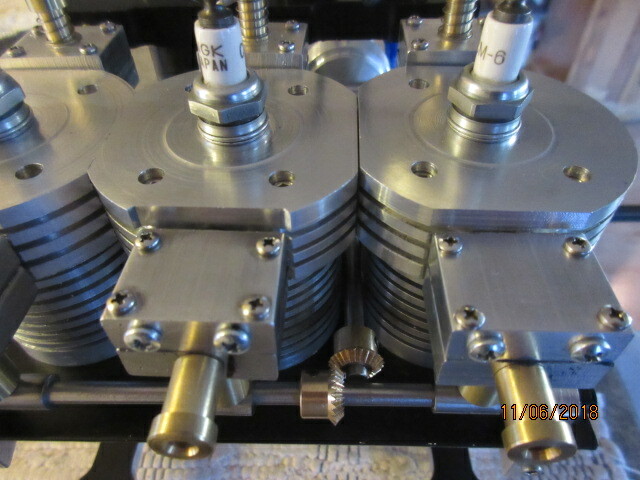 43CC's. 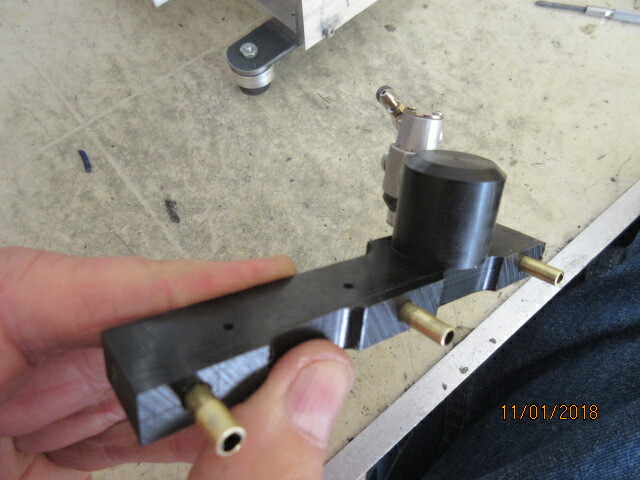 Bore & Stroke: 1.0 x 1.125 inch. Build of SUPER TEE started Sept 5th and completed Nov 9th. (10 weeks). Something new! 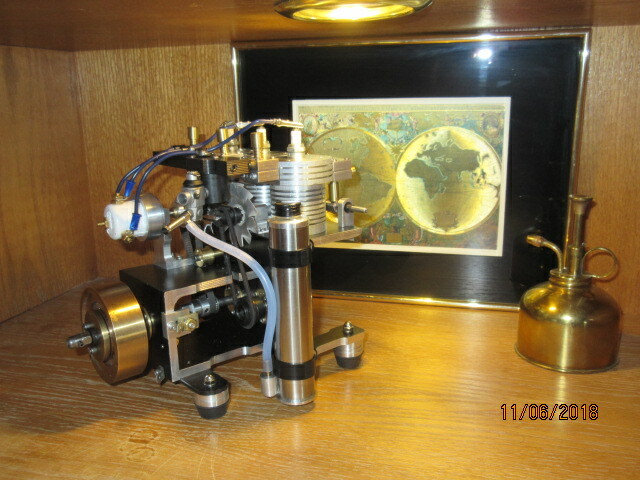 Featuring geared cylinders to crankshaft. SUPER TEE is a fine runner! Very slick! Sounds like a hot rod warming up before the drag race! 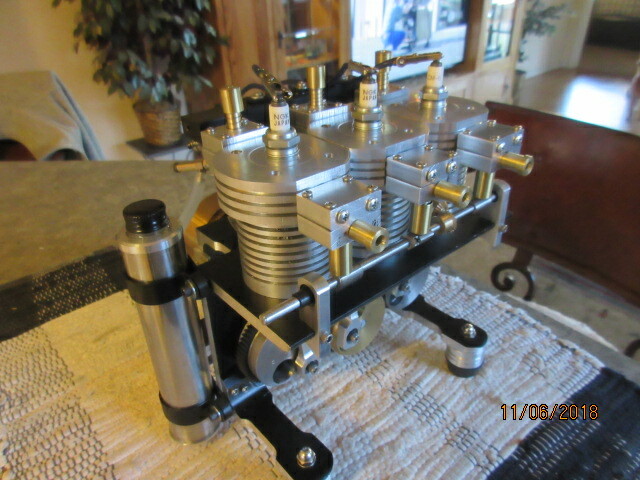 Very interesting engine! Well done! 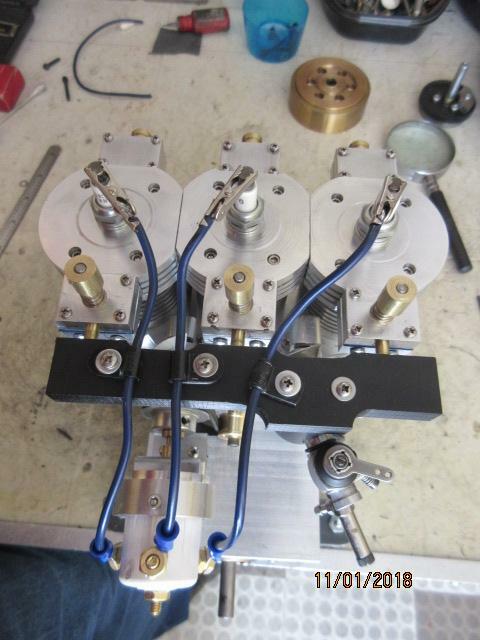 I like your style of engine building. Very Interesting and a very nice build.